Then bake this Dark Chocolate Zucchini Cake with the rest of your green veggies. Chocolate covered veggies always get my vote! I have so many random thoughts going through my head today. Let’s try to process them all while we eat homemade chocolate donuts. Why do I stay up so late every night, and then think I will get up “early” the next day? I have such a bad habit of “burning the midnight oil”. Actually it’s way past midnight before I shut it all down and head to bed. This tends to happen every single night. No wonder my body doesn’t function properly the next day, and I need multiple cups of coffee with my favorite Salted Caramel Mocha Creamer in it. Why can’t I ever tear the saran wrap off right??? I think the box is out to get me…every. single. time! It can’t be the brand, because I have tried them all, thinking the cheap ones were the problem. Turns out it has to be a user error because my husband can tear a straight line AND keep it from sticking to itself. I tend to tear it off at an angle, ripping and shredding it as I go, and then all of a sudden it ends up in one giant lump. Curse you saran wrap!!!! I didn’t want to cover those Zebra Brownies anyway. I mean when you are sharing delicious things like Coffee Cream Brownies extra exclamation points are necessary!!!!! Oh, and the over use of colon smiley’s 🙂 Yup, I do that too!!! Where have all the donuts gone? Is it doughnut or donut??? I always wonder that when I type it. 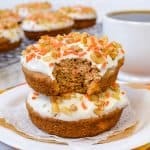 I can’t stop thinking about these yummy Carrot Cake Donuts we made earlier this year. They are so good!! I am sort of kind of partial to the shorter version of the word. Too lazy to type the extra letters? Yea, probably. 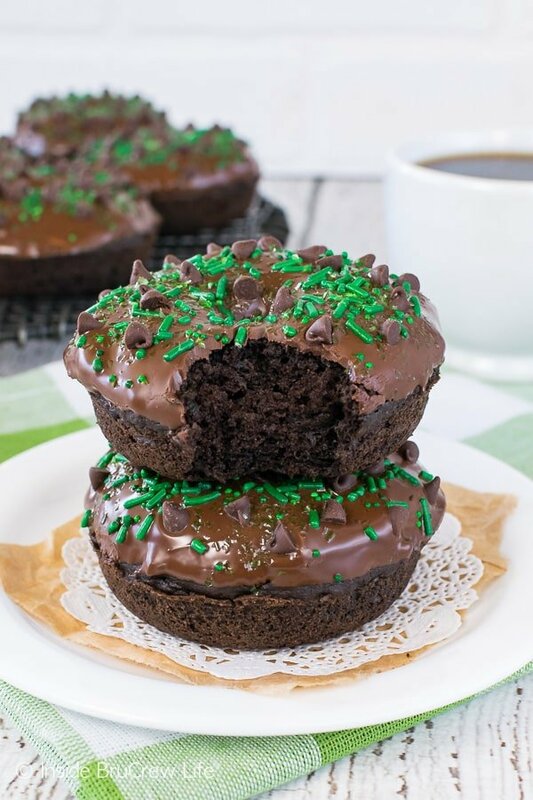 Healthy chocolate donuts for breakfast always gets a “yes, please” from me!!! These chocolate bites of goodness did not last long at all in our house! They were eaten for breakfast and snack time. I may have even eaten one (or more) for dinner because they have yogurt and zucchini in them. That sounds like a perfectly acceptable dinner to me! Wink, wink. My biggest tip for you is to spoon the batter into a large ziplock baggie and cut one corner off to “pipe” the batter into the greased pan. It’s makes it so much easier to fill the pan. Baker’s Joy is a great baking spray to keep your donuts from sticking to the pan. I am really happy this donut phase in my life is still going strong. Donuts are just kind of fun to make!!! Faster and easier than cupcakes, but with the same delicious satisfaction! 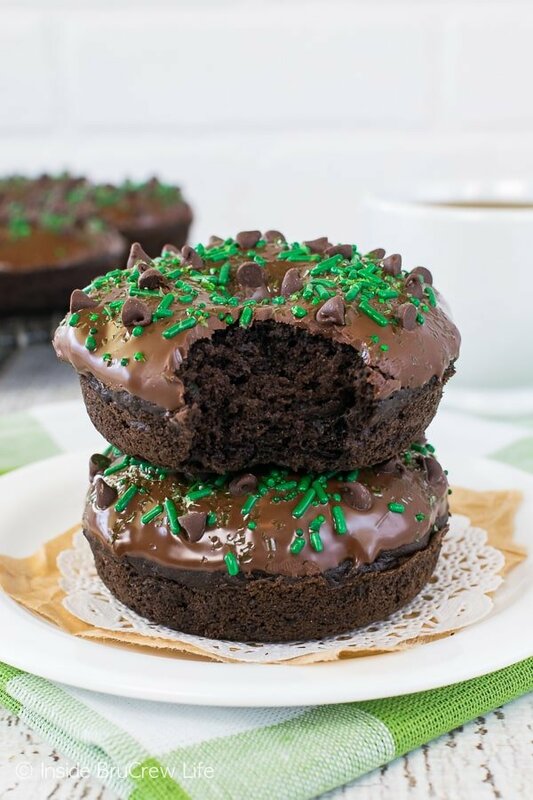 But now I am really sad because these Chocolate Zucchini Donuts were gone way too quickly. They were so delicious dipped into the chocolate! The slight crunch when you bite into each one was out of this world! Time to make more donuts ASAP! For the children, of course. 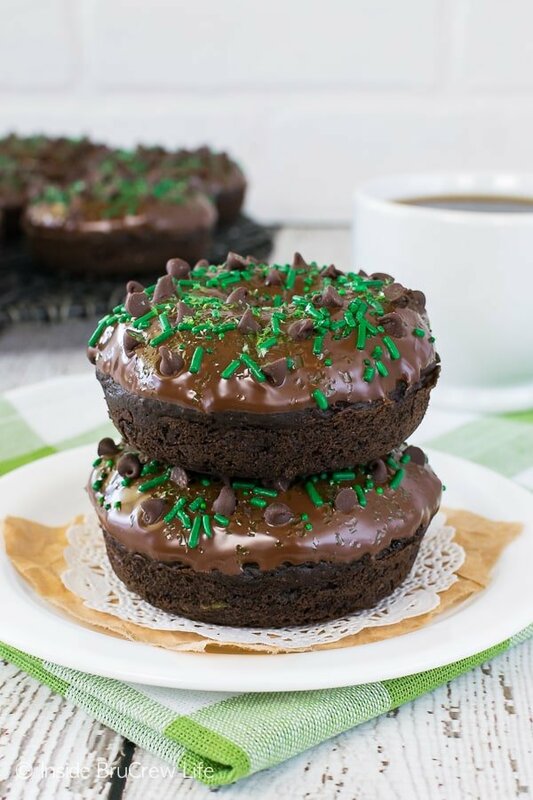 These soft Chocolate Zucchini Donuts are loaded with three kinds of chocolate. It's a delicious way to eat your "greens" for breakfast. Preheat the oven to 375 degrees. Spray a regular sized donut pan with nonstick spray. Cream the butter and sugar until fluffy. Add in the egg, yogurt, and zucchini and continue to cream. Sift together the salt, flour, cinnamon, nutmeg, baking soda, baking powder, and cocoa powder. Slowly add to the butter mixture alternately with the buttermilk. Stir in 1/2 cup mini chocolate chips by hand. Do not over mix. Spoon the donut butter into a large ziplock bag and cut one tip off. Fill the donut pan cavities no more than 3/4 full. Bake for 12 minutes. Let cool in the pan for 2-3 minutes before removing to a wire rack to cool completely. Place the chocolate chips in a microwave safe bowl with the shortening. Heat and stir 30 seconds at a time until melted. 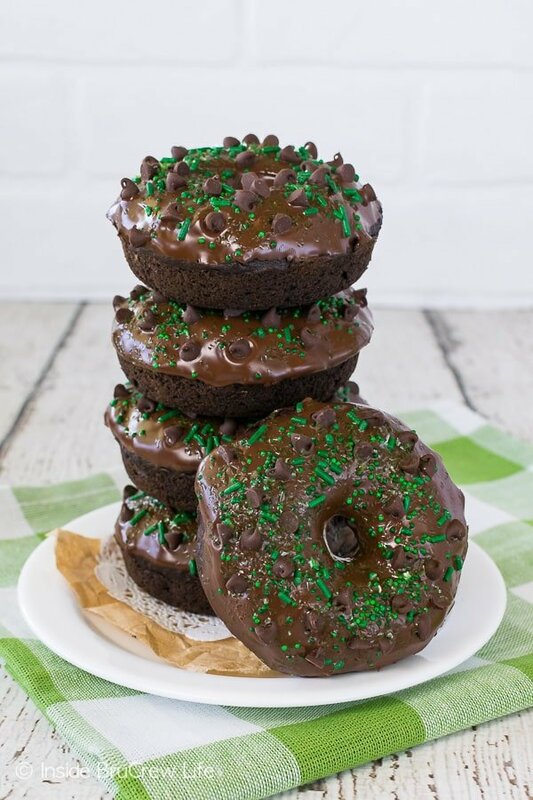 Dip the tops of the donuts in the chocolate. Top with the remaining chocolate chips, sprinkles and edible glitter. Let the chocolate set before serving. Store in a loosely covered container. 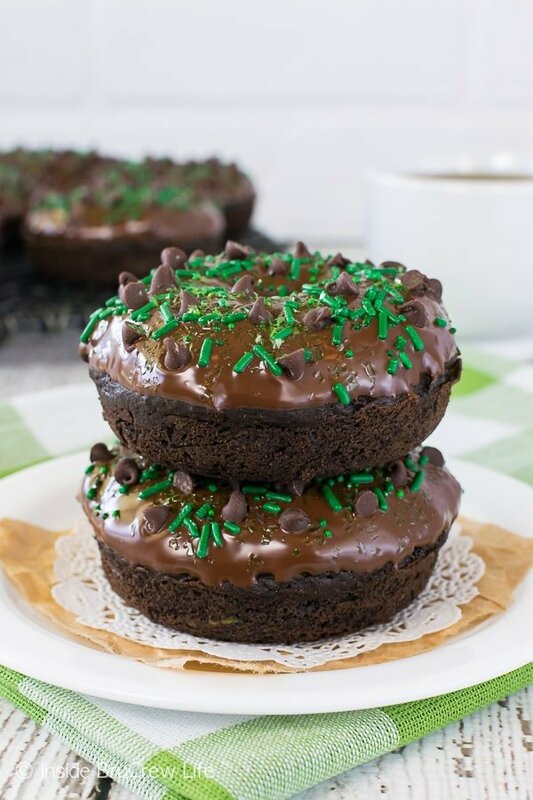 *This post for Chocolate Zucchini Donuts was first posted on June 24, 2012. **This post does contain an affiliate link. 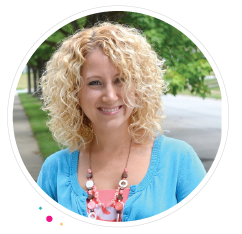 Inside BruCrew Life may receive a small percentage from sales made through these free links. As always, there is no extra charge to you. Thank you for letting us share products we use and love. These do look yummy. I always opt for the easy spelling too! I haven’t had donuts in awhile–I need to get those donut pans to use and quick! And healthy donuts? Um, sign me up like yesterday. The fireworks pattern on them is so cute! And you’re all decked out in your 4th of July props, too 🙂 and by the way, I’m now extremely self-conscious of how many exclamation points and smileys will be in this comment alone lol. BAHA, curse you saran wrap!! I laughed at each comment and agree with all of them. And this recipe… what can I say? Its fantastic. Im pinning and using soon. Thanks! Saran Wrap? What’s that? I gave up using it many years ago, FOR THE SAME REASON! These donuts look great! Here’s how I change the spelling, if they have yeast, I write doughnut, otherwise I write donut. But not always, like when I’m lazy. haha!!! Love that these have zucchini. My husband is always shaking his head at me when he finds the mess of the roll of Saran Wrap shoved back in the drawer. He tears it perfectly straight–no problem–and I can’t do it. At. ALL. Okay, so I’m totally needing to get my donut pan down off my baking shelf and put it to use. These look amazing!!! My hubby laughs at me every time I try to tear off a piece. I just need to give up and use foil every time! Definitely get the donut pan out…they are so fun to make!!! I wish I had more too:-) Thanks girl!!! 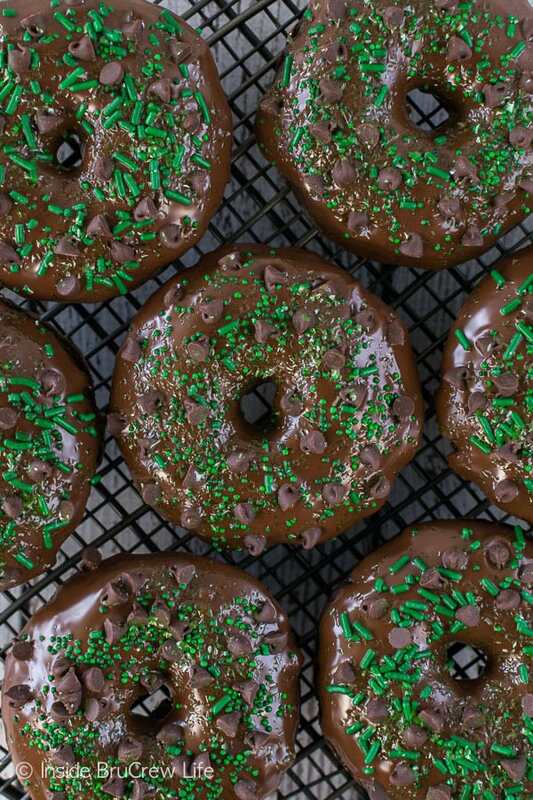 I so want to make these donuts! What a brilliant creation! Absolutely brilliant. These look scrumptious! Thanks so much for sharing at Mix it up Monday 🙂 Oh and I hate saran wrap too…it never works right for me, lol. Please let me know what temperature to cook these at and also you didn’t say how much salt in your recipe. I am making them now! Thanks! Whoops that was a big one to forget to put in there. Thank you for catching that for me. I fixed the recipe;-) Hope you like them as much as we did!!! We absolutely loved them! I ended up using 1/4 tsp salt because I didn’t see your response in time. I also added 1 tsp expresso powder to kick up the chocolate flavor. They were amazing!! My 12 year old decided to decorate with red, white, and blue sanding sugars! Thank you for the wonderful recipe & blog! 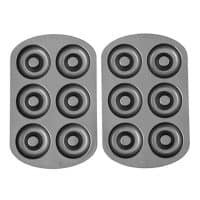 Is there are variation we can cook them at if we don’t have a donut pan? Maybe a muffin or something? These look YUMMY! I have zucchini coming out of our ears from the garden, I love baking with them! 🙂 Thanks! Love these and I use way too many ellipses! Apparently I drive some readers crazy with them….. Oh well! Must make these! These are fantastic and SO festive! They sound so delicious. I hope you’ll add these to my Patriotic Project Parade going on now through July 4th! I’m on a bit of a doughnut kick myself. 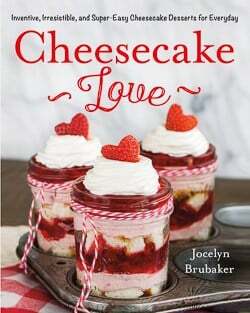 I have to try some of your recipes soon. I love zucchini in baked goods. 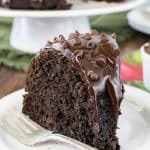 I make a chocolate zucchini that is always a big hit. If you get a chance I’d love for you to share these over at Whatcha Whipped Up Wednesday . I’m pinning these to make soon! perfect for the holiday weekend! Jocelyn, I hope you and your family had a very happy 4th of July! 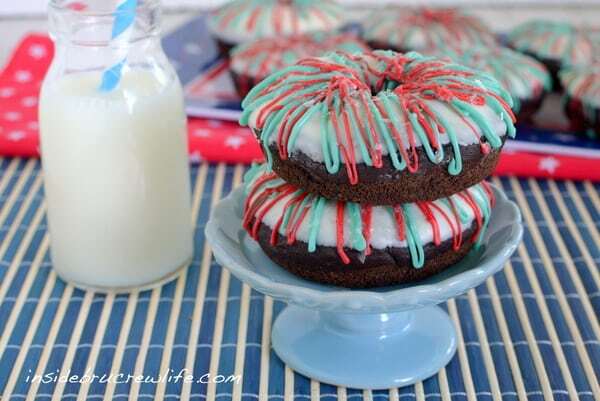 Your donuts not only sound divine, but they look so festive and fun! They look like fireworks, awesome! Hi, Gia. I don’t mind if you borrow the picture and link back to my site for the recipe. Would you please remove the recipe from your site though? Thank you so much!! 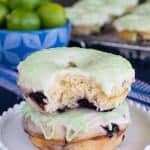 These doughnuts sound amazing! I love that there is zucchini in them! 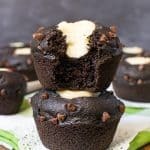 If there is one way to get my son to eat zucchini, it would be with chocolate and frosting! Whooop! When it’s doughnut day, my taste buds come calling! These look awesome! 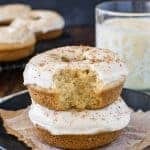 Can this recipe be used for cupcakes rather than a doughnut? 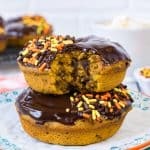 Yes, you can bake the batter in muffin liners. I would say fill them at least 3/4 full and bake about 15-16 minutes. Thanks so much for this delicious recipe! I shared the link in my post today.